Stress fractures are micro fractures that can occur in any bone in the lower extremity or spine. The most common area is the metatarsal bones in the foot but they are also seen in the leg bones. The most common presentation is a patient who presents with a sudden alteration in their training regimen (i.e. more sprinting, increased mileage or increased intensity) that develops pinpoint pain and localized swelling over bone. This type of injury is more common in women with menstrual irregularities and lower calcium intake. They are also very common in teenage girls who are very active in sports and who are very thin framed. Bone Marrow edema is the preclude to a stress fracture. Before a true "pathological" stress fracture occurs, bone marrow edema occurs, which weakens the bone. Rarely, bone marrow edema syndrome can occur, which is an idiopathic cause of edema located inside the bone marrow. Repetitive stress to the bone over a short period of time. May occur at the beginning of a sports season in an unconditioned athlete. Commonly seen in patients who have osteopenia or osteoporosis. A new job or activity requiring the patient to be on his/her feet for a long period of time. Structural abnormalities (high arched foot, bowleggedness, knock-knees, flatfoot) may predispose people to stress fractures. Rarely bone tumors may cause pathologic stress fractures. Pinpoint tenderness to any bone of the lower extremity. Localized swelling over the area. Pain may be minimal in the morning but as the day goes on the pain gets worse and more swelling becomes apparent to the involved region. Inability to participate in sporting activities due to the level of pain that worsens with the activity. X-RAYS: X-rays may be negative for a stress fracture for three weeks. Bone scans and MRIs are rarely necessary. TREATMENT: The type of treatment instituted depends on the bone involved and the length of time that the patient has had the condition. A change in a person’s job may be necessary for a short period of time to rest the affected bone. Rest from the activity precipitating the problem. Cross training to activities that do not stress or overload the bones (i.e. swimming, cycling, Stairmaster). A change to a softer running athletic surface and the use of cushioned shock absorbing custom molded orthotics (insoles for the shoes). Occasionally immobilizing the extremity in a hard cast or removable boot may be necessary if weightbearing is painful. Surgery, if the bone fails to heal, may be necessary but it is rarely needed. In females with menstrual irregularities, follow-up with their physician is imperative. 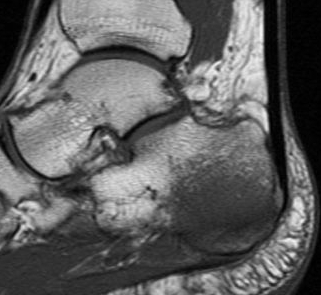 Bone marrow edema is visible on MRI studies with a contrast in the bone color in the bone, on a T1 image, will be white; the bone marrow edema will appear gray to black (pictured below) such as the image depicts in the calcaneus.